1 – Slice the tofu into 1/2-inch thick cutlets. Leave the tofu on the cutting board and sprinkle both sides of each piece with the salt. 2 – Place a casserole dish with a flat bottom on top of the tofu and then stick something under one side of the cutting board to prop it up so that the liquid pressed out of the tofu can run down to the lower end of the cutting board (you may want to do this in your sink so you don’t make a mess on your counter). Leave this for 15 minutes. 3 – Dry the tofu off with paper towels and then dust each piece with flour. 4 – Heat a frying pan over medium heat until hot and then add the sesame oil. Swirl to coat the pan and then add the coated tofu. 5 – Adjust the heat down to prevent the oil from smoking and fry undisturbed on one side until you start seeing the edges of the tofu browning (about 6 minutes). 6 – Flip the tofu over and fry until the second side is browned (about another 6 minutes). 7 – Arrange the tofu onto a serving platter. Turn the heat off and wipe out any extra oil from the pan using paper towels and tongs. 8 – Add the soy sauce, vinegar, sugar and sake to the pan and boil the mixture over high heat until it forms a thick glossy glaze. Well we ended up with about 4″ or more of new snow! And another possible 1″ overnight. But warmer and nicer weather coming next week, hopefully! Ate Breakfast while watching Team U.S.A Men Hockey go up against their arch rival Russia. It went to an overtime shoot-out but the U.S.A. won it 3-2! U.S.A. U.S.A.! Really enjoy the Winter Olympics. 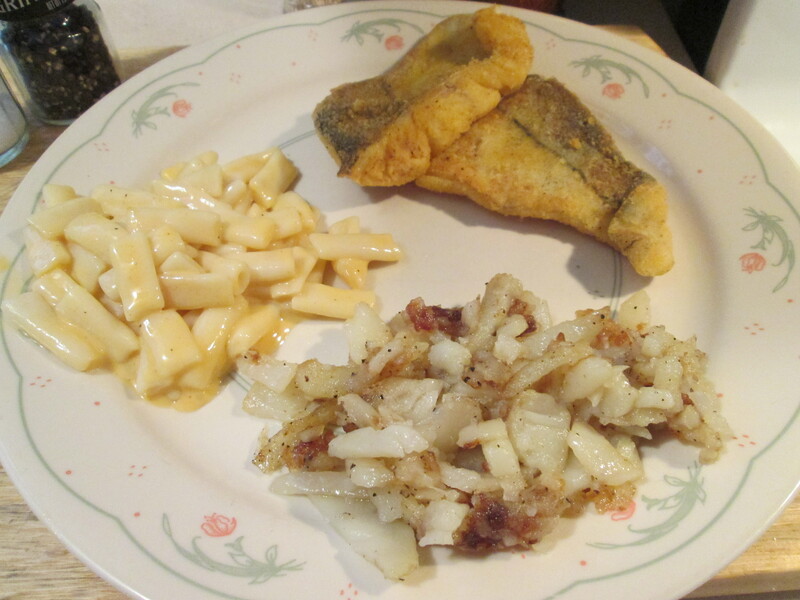 For dinner tonight it’s a Seasoned Fried Haddock w/ Tofu Mac & Cheese and Fried Red Potatoes. I had Haddock Fillet in the freezer, bought on sale at Kroger a while back. I laid the fillet out in the fridge overnight to thaw. To prepare it I rinsed the fillet in cold water and patted dry with a paper towel. Then sliced the fillet into smaller pieces. I then seasoned it with just a bit of Sea Salt and put the pieces in a Hefty Zip Plastic Bag where I then added Zatarain’s Lemon Pepper Breading Mix. Shook until all the pieces were well coated. I then pan fried them in Canola Oil, frying them about 3 minutes per side until golden brown. Haddock and Zatarain’s is a perfect combo, delicious every time! For one side dish I made some Tofu Mac & Cheese! I used TOFU SHIRATAKI (Yam Noodle with Tofu) MACARONI SHAPE which is only 20 calories and 1 net carb per serving! To prepare it I used 1 serving of Velveeta 2% Cheese, a small handful of fresh shredded Dutch Gouda (for that creamy texture), 2 teaspoons Hungarian Paprika, and Sea Salt and Ground White Pepper (to taste). To start drain and rinse the Tofu thoroughly. Microwave for 1 min., to reduce the authentic aroma. Dry very well and jut use as you would regular cooked noodles. Add the ingredients and stir until well mixed. I then put them in a small sauce pan and heated it on medium, heated until the Cheese was melted and Tofu was heated through. Came out rich and creamy with a nice flavor. 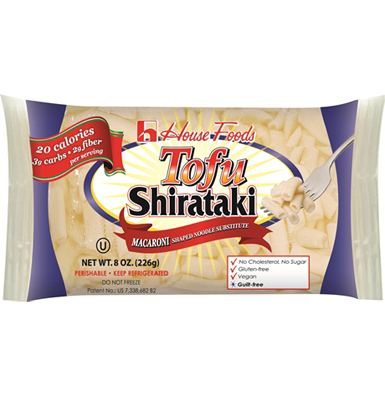 I should you use House Tofu Shirataki – Tofu Shirataki more often, no excuse not to except I forget about buying it. Kroger has a small variety of it sometimes but it’s Jungle Jim’s International Market that has it in all varieties and always in stock. Makes a fine side dish and a good alternative to Pasta. For my other side dish I peeled and sliced up some small to medium-sized Red Potatoes and pan fried them in a Cast Iron Skillet. After thin slicing them I rinsed them off and dried them with a paper towel. Then seasoned them with McCormick Grinder Sea Salt and Black Peppercorn. Then pan fried them in Cat Iron Skillet in Canola Oil, turning them over several times with a spatula until they were starting to brown on both sides. Love Potatoes and love the pan fry method! A delicious dinner for a cold Winter’s Day, and saved a lot on calories and carbs by having Fish and by using Tofu Macaroni. For dessert later a Weight Watchers Vanilla Swirl Ice Cream Cone. 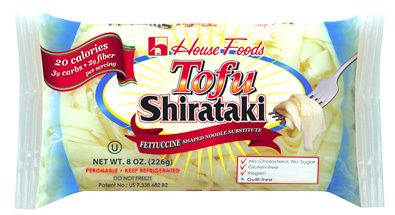 House Tofu Shirataki – TOFU SHIRATAKI (Yam Noodle with Tofu) MACARONI SHAPE 8oz. A Dieters Delight! With only 20 calories, 3g carbs per serving and no cholesterol, Tofu Shirataki is a pasta lovers’ dream! And as a great bonus-it’s gluten-free! It is a healthy, uniquely textured noodle – that pleases people of all ages! What’s all this noodley hubbub about? It might seem like these pasta enthusiasts are just over-excited, but these are real people who are really crazy about Tofu Shirataki! Tofu Shirataki is a stunning pasta alternative made by blending the flour of the Konnyaku – a member of the Asian yam family and tofu. It is a healthy, uniquely textured noodle that has noodle lovers raving. Tofu Shirataki has been pegged as a pasta alternative because unlike pasta, it’s gluten-free, low in calories and low in carbs! It’s also cholesterol-free, sugar-free, dairy-free, vegan and kosher certified. Offered in a variety of shapes including, macaroni, spaghetti, fettuccine and angel-hair we have enough to satisfy all your noodle needs! Can you ask for more? Our fans don’t think so. Read some additional reviews if you need more convincing, but the secret is in the Tofu Shirataki! A comfort food classic, with a bit of a spin, for dinner tonight. It’s a Fish sandwich with Mac and Cheese! I love Mac & Cheese but I don’t like the calories and carbs that usually come with it. So to cut back on the calories and carbs I replaced the Pasta Macaroni with Tofu Shiratki (Yam Noodle with Tofu) Macaroni Shape Noodles. I used a Red Snapper Fillet for my Fish. After rinsing the fillet off with water I patted the fillet dry with a paper towel. I then seasoned it with Sea Salt, Black Pepper, and Garlic Salt. Then rolled it in Progresso Italian Style Bread Crumbs. I pan fried it in Canola Oil about 3 minutes per side. Came out with a beautiful golden brown crust and moist and delicious! Served it on an Aunt Millie’s Deli Style Whole Wheat Mini Sub Bun and topped with a slice of Borden Smoked Cheddar. Now for the Mac & Cheese, this is where it gets good! I used TOFU SHIRATAKI (Yam Noodle with Tofu) MACARONI SHAPE which is only 20 calories and 3 carbs! I added a half a serving of Velveeta 2% Cheese, and a Tablespoon Kraft Shredded Parmesan Cheese. Seasoned with Sea Salt and Ground Black Pepper. Mix it all together and microwave on high for 1 minute and 40 seconds. After the first minute stop it to stir and continue with 40 seconds, the time can vary according to your microwave. I’m starting to use Tofu more and more as a noodle substitute. Huge difference in calories and carbs between the two. A thank you to Hungry Girl for the idea. I left the recipe and the link to the Housefoods Tofu at the end of the post. For dessert later a bowl of Breyer’s Carb Smart Vanilla Ice Cream topped with Bob Evan’s Glazed Apples. *Drain excess liquid. Dry thoroughly with paper towels. *Add Noodles back to bowl and add Velveeta and Cheese slice to Noodles breaking both into pieces as you add them. Microwave for 1 minute. Stop and stir, mixing well, and continue to microwave for an additional 40 seconds. Optional, sprinkle extra Shredded Parm Cheese and Turkey Bacon Bits on top before serving. Tofu Shirataki is a great pasta alternative made from blending the root of the Konnyaku – a member of the yam family and tofu. Prepared a healthy version of Fettuccine Alfredo with Chicken tonight for dinner. 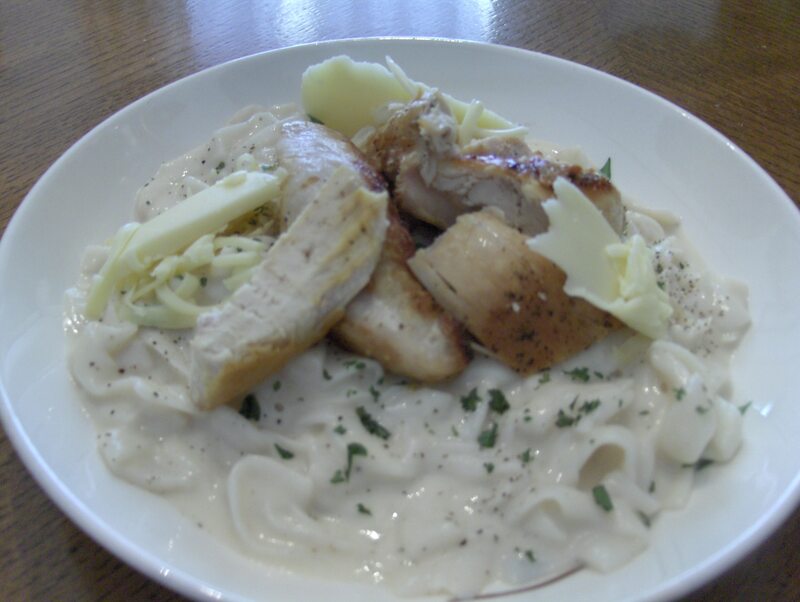 I used 2 skinless Chicken Breasts, Classico Light Creamy Alfredo Sauce, Fresh Shredded Smoked Dutch Gouda Cheese, and the big calorie and carb cutter House Foods Tofu Shirataki (Fettuccine Shaped Noodles Substitute). You’ll just need Extra Virgin Olive Oil, Sea Salt, and pepper for seasoning. Then cook the Tofu Noodles according to package instructions. Meanwhile, lightly rub chicken with olive oil. Season with salt and pepper if desired. In a large skillet over medium high heat, brown chicken for 7 to 8 minutes on each side, or until an internal temperature of 165°F is reached. Remove chicken from skillet. Allow to rest for 5 minutes and cut into thin strips. Meanwhile, in a small saucepan over medium heat, warm the Classico Pasta Sauce for 4 to 6 minutes, or until heated through, stirring occasionally. The Sauce is only 60 calories and Toss Noodles Sauce with cooked pasta until well coated and top with chicken strips and grated Smoked Dutch Gouda Cheese. Serve immediately. I left the full recipe and instructions at the bottom of the post. I served with Healthy Life Whole Grain Bread and a few of the Marinated Olives I made yesterday. Everything turned out fantastic! if you’ve never gave the Tofu Noodles a try, it’s time! I left the product info and web link to House Foods below. By using Tofu instead of normal Whole Wheat Pasta i saved about 160 calories and 45 carbs! Huge difference. For dessert later a bowl of Blue Bunny Natually Frozen Chocolate and Vanilla Swirl Yogurt. Here’s a tip: For added flavor, add 1 Tbsp. of chopped fresh basil to olive oil rub. *The Macaroni shape is available in only selected retailers. 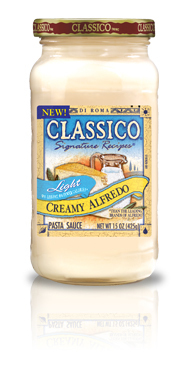 Classico® Light Creamy Alfredo has 50% less fat and 45% less calories than the leading brands of alfredo sauces, but all of the rich and creamy taste. This better-for-you indulgence is made with real, high-quality ingredients like cream, Parmesan cheese and butter. Tofu Spaghetti! This is a great Pasta substitute. I used House Tofu Shirataki Spaghetti Shaped. I rinsed and heated the Tofu by the instructions, which I left at the bottom of the post along with description and web links. Plus it’s only 20 calories and 3 carbs per serving! It comes packaged 2 servings per bag and with the low calories and low carbs you can have both servings for only 40 calories and 6 carbs. That’s a huge difference between whole wheat pasta and the tofu calorie and carb count. You’ll have to give this a try I think you’ll be surprised. I left the Tofu info and web site link at the bottom of the post. For my sauce I used my favorite pasta Sauce, Bella Vita Low Carb Meat Flavored Pasta Sauce. If you watching the calories and carbs this sauce is the Bomb! Comes in Roasted Garlic and Meat Flavored and is only 70 calories and 6 carbs! The Meatballs were Honey Suckle White Turkey Meatballs. Love these Meatballs great flavor and they make a delicious Meatball Sub! They are 190 calories and 6 carbs per serving (3 Meatballs). I seasoned it with McCormick Grinder Italian Seasoning and topped everything with a sprinkle of Kraft Shredded Parm and Kraft 2% Shredded Sharp Cheddar. 330 Calories and 16 carbs for a Spaghetti Dinner, not including your bread. For dessert later a Yoplait Chocolate/Banana Smoothie. Step 1: Empty your noodles into a strainer, and rinse them with water to get rid of the liquid they were packed in. Step 2: Dry them as thoroughly as possible by blotting with paper towels — remove as much moisture as possible. We cannot stress enough how important this is. Step 3: Cut them up a bit; they can be VERY long. (Fun fact: We once found a noodle that was six feet long!) Kitchen shears (scissors you use only for food) make this super-easy. Tofu Spaghetti! Years ago I would have said “No Way” but now as I’m older and trying to eat more healthy this is great! I used House Food Tofu Shirataki Spaghetti Shaped Tofu. I made Mac & Cheese with Elbow Macaroni shaped Tofu a couple of weeks ago so I wanted to give Spaghetti and Meatballs a try. I heated the Tofu by the instructions, which I left at the bottom of the post along with description and web links. For my sauce I used my favorite pasta Sauce, Bella Vita Low Carb Meat Flavored Pasta Sauce. If you watching the calories and carbs this sauce is the Bomb! Comes in Roasted Garlic and Meat Flavored and is only 70 calories and 6 carbs! The Meatballs were Honey Suckle White Turkey Meatballs. 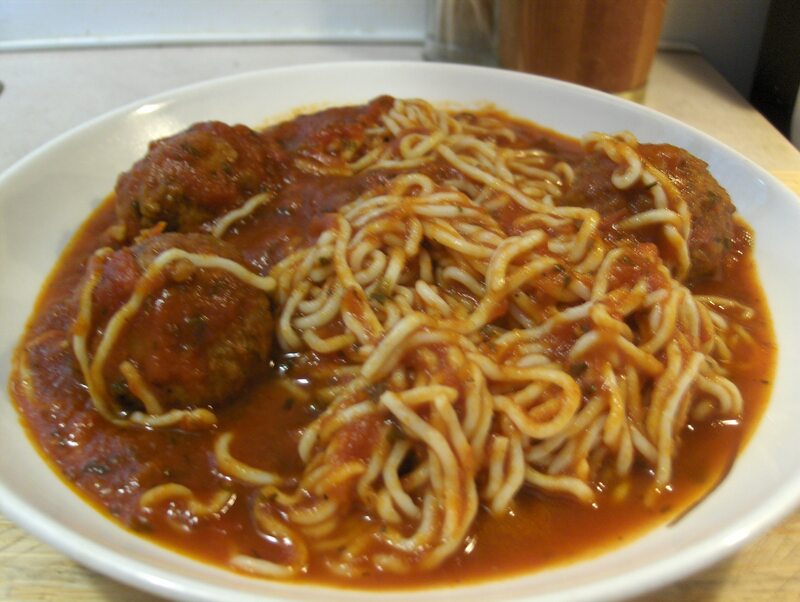 Love these Meatballs great flavor and they make a delicious Meatball Sub! They are 190 calories and 6 carbs per serving (3 Meatballs). I seasoned it with McCormick Grinder Italian Seasoning and topped everything with a sprinkle of Kraft Shredded Parm and Kraft 2% Shredded Sharp Cheddar. The nice part about this dinner, besides being delicious, is you can have a second helping and still have a low calorie and carb dinner. The one bag of Tofu makes more than enough for two people. For dessert/snack later a 100 Calorie Bag of Jolly Time Mini Bag of Pop Corn. Shrimp with Mac & Cheese a great combo. 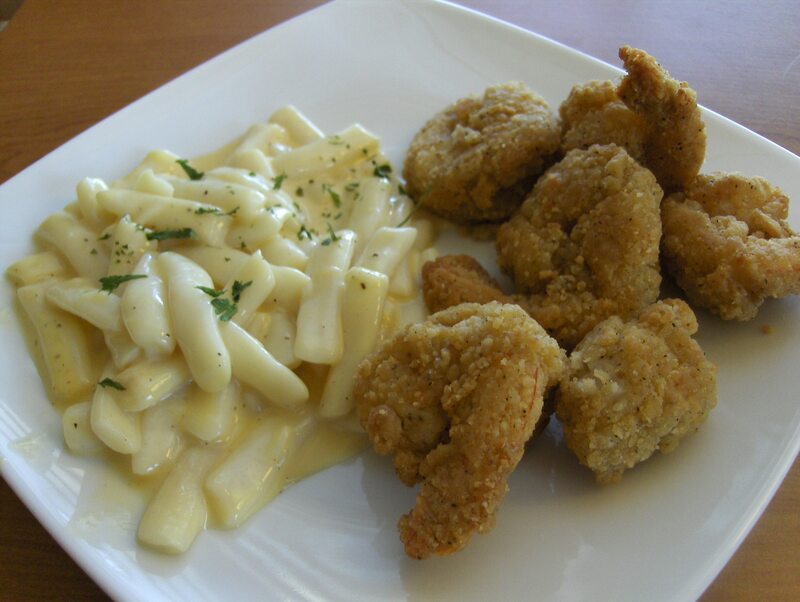 Shrimp with Mac & Cheese under 400 calories a fantastic combo! I used Gorton’s Homestyle Shrimp. They come in breaded seasoning and baked at 425 degrees for 18 minutes. These are the best tasting boxed and frozen Shrimp I think I’ve ever had. Delicious and good size Shrimp. Now for the Mac & Cheese, this is where it gets good! I used TOFU SHIRATAKI (Yam Noodle with Tofu) MACARONI SHAPE which is only 20 calories and 3 carbs! I added a half a serving of Velveeta 2% Cheese, 1 slice Sargento Ultra Thin Swiss Cheese, and 1/4 teaspoon Kraft Shredded Parmesan Cheese. Seasoned with Sea Salt and Ground Black Pepper. Mix it all together and microwave on high for 1 minute and 40 seconds. After the first minute stop it to stir and continue with 40 seconds, this time can vary according to your microwave. This came was the first time I tried this and it came out delicious! I’m starting to really like using Tofu as a noodle substitute. Huge difference in calories and carbs between the two also. A thank you to Hungry Girl for the ideal. I left the recipe and the link to the Housefoods Tofu at the end of the post. I also had Healthy Life Whole Grain Bread. For dessert later something new a Yoplait Chocolate Banana Smoothie. i seen these on Biggest Loser and they looked so good I had to try it out and glad I did! Easy to make and a nice thick and tasty Smoothie. Only 130 calories and 18 carbs! I’ll leave the write up and nutrition on the post below. *Add cheese wedge and cheese slice, breaking both into pieces as you add them. Microwave for 1 minute. Stop and stir, mixing well, and continue microwaving for an additional 40 seconds. *Add remaining ingredients and stir very well.